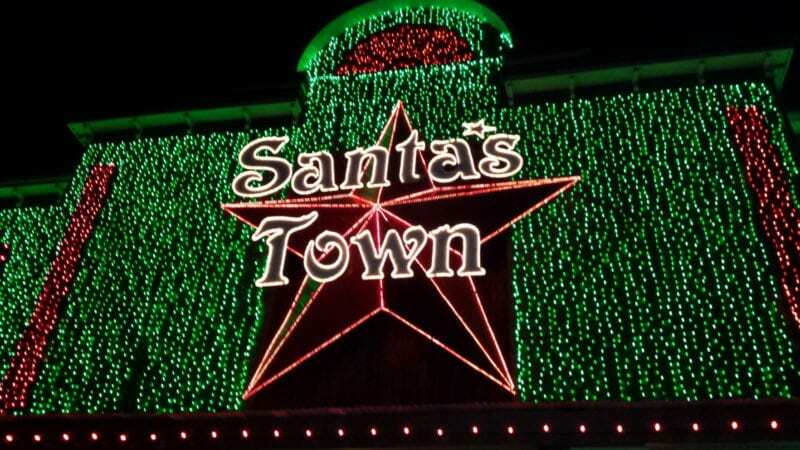 Year after year, more than 200,000 visitors flock to Santa’s Wonderland in College Station Texas. 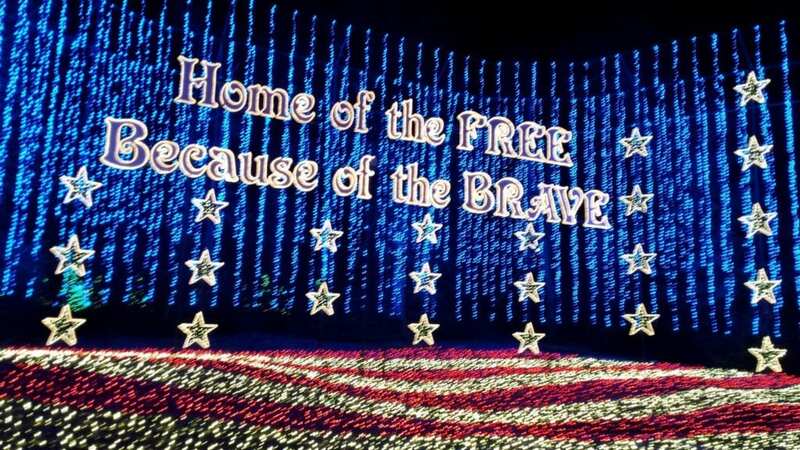 They come from hundreds of miles away to see this Texas-sized light display. 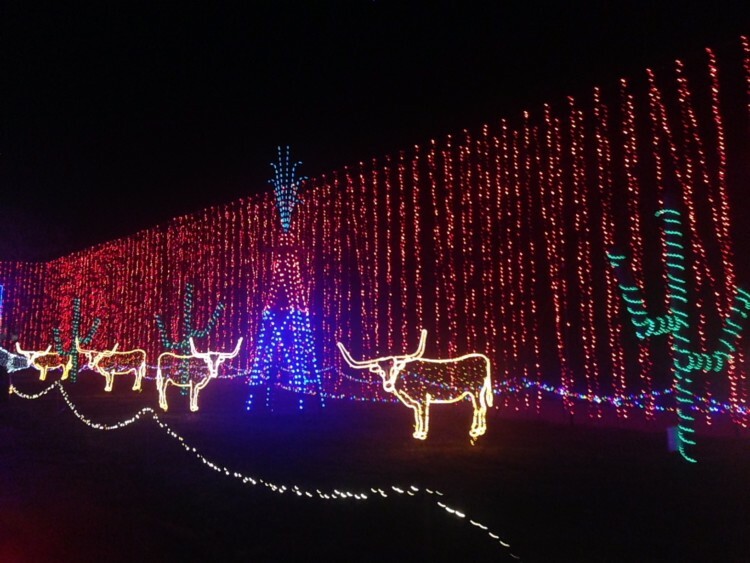 But, as this Santa’s Wonderland Texas newbie discovered, this is oh so much more than just a holiday lights display. 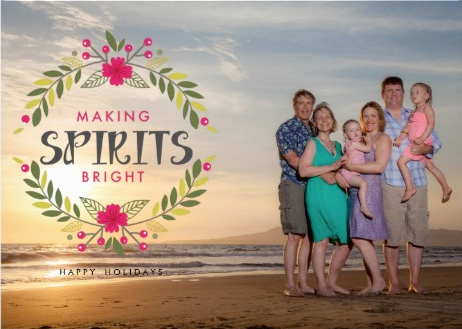 It is a destination to embrace the Christmas Spirit for all ages! 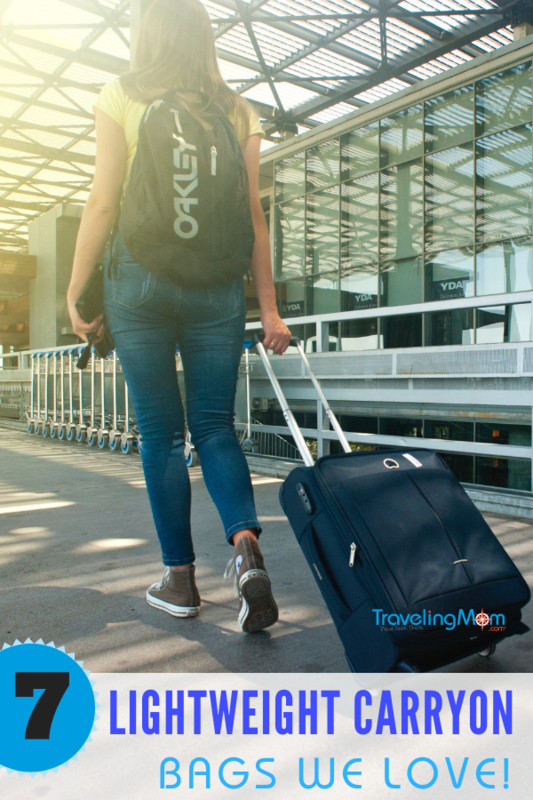 Traveling Mom uses affiliate links that may pay us if you purchase through them. Thanks for your support. 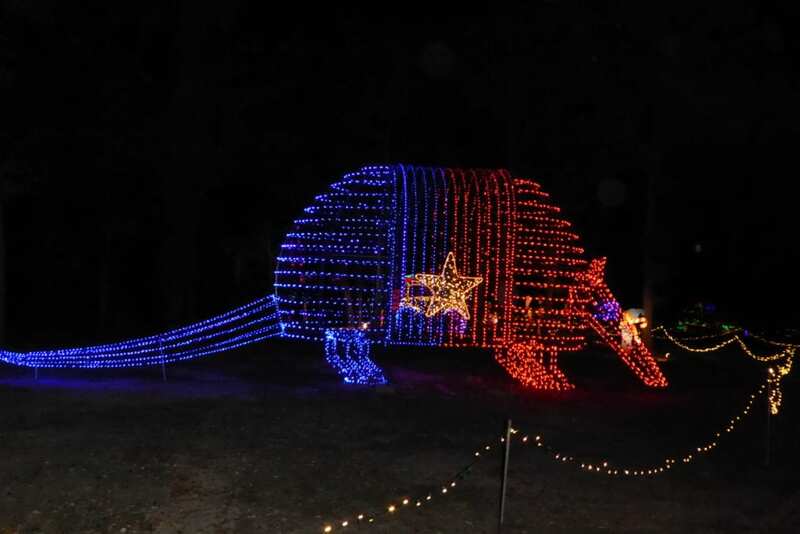 Ready to Visit Santa’s Wonderland Texas? 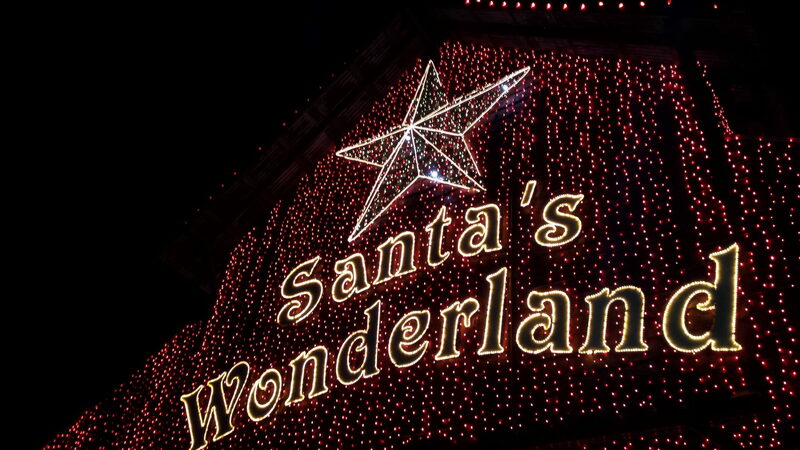 Santa’s Wonderland is more than about lights. There is a reason that folks come back annually with their families. Just enough changes to make it fresh. But the old favorites such as Texas Santa, Marshall Frostbite (the 7-foot-tall snowman mascot), and the hayride are there. Silly me, coming from the Northeast and never having been before, I assumed that it was lights and a few activities. I was wrong. Very wrong. There are bands, shopping, food, activities, movies playing, and plenty of places to sit down. We could have spent far longer there watching the movies and I would have planned more time for Christmas shopping. 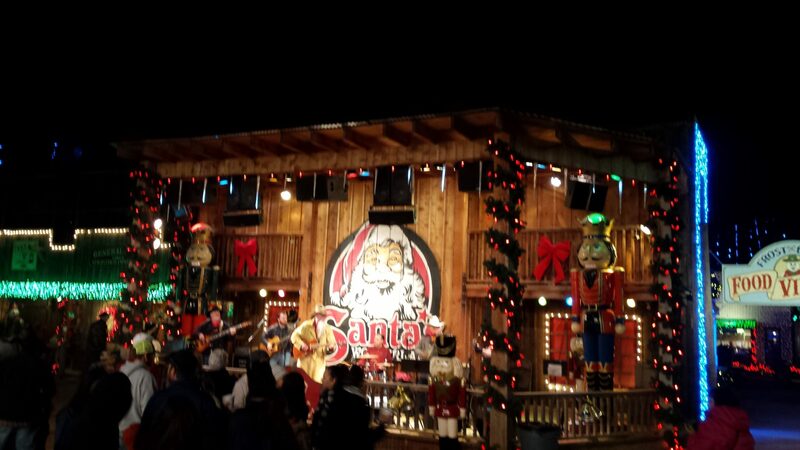 So here are tips from a Santa’s Wonderland Texas newbie to make your visit go smoothly. 1. Plan your arrival time accordingly. Since we didn’t know about all the offerings, we came later because we didn’t want to hang out for too long before it got dark enough for the lights to show up in pictures. Big mistake. Also Santa “opens” the park each night which we never got to see. In retrospect, we should have gotten there at opening at 3pm because……. 2. It takes a REALLY long time to see Santa if you don’t plan right. The line may not look too long from the outside, but once you hit the inside of the building there could easily be an hour and a half wait. We should have arrived at 3 pm and gone straight to the Santa line. Santa’s Wonderland does a great job of entertaining folks once they get in the building–think Disney-style activities for those waiting. But for little kids, it is still a long wait. Going right when it opens would cut the wait time and knock it out right at the beginning. Next year we will remember this. UPDATE: On our second visit the design of Santa’s Cottage had designed. This was a good thing because you could see how long the line was! Santa gets breaks and the line tends to die out around that time. It’s a good time to queue up. One adult can stay in line and the newly located kiddie train is right behind Santa’s cottage. The kids can ride it multiple times while waiting. 3. If you can go to Santa’s Wonderland on a weeknight, DO IT! Weeknights are far less crowded than weekends, and I highly recommend aiming for a weeknight for your trip. Tickets are $5 less on many weeknights. There is also VIP parking available for an extra cost. We had no issues parking but we went early in the season. Many, many folks recommended buying VIP parking if you go in December. I’m torn on whether it’s worth it or not. My husband felt strongly that it was the same amount of time to park in the free lots once you factored in waiting in the line of cars to get into the VIP lot. If you do NOT buy VIP parking when you get off the exit for Santa’s Wonderland, get in the left lane! The right lane of cars that isn’t moving? They’re waiting to turn into the VIP parking lot. Just scoot on over to the armory and take the bus over to save time. And of course…..
4. Buy your tickets online! This will save a lot of time when you arrive. I always search Santa’s Wonderland on Groupon to see if there are any Groupon deals to snag that will save you a ton. You can also check Living Social. Tickets may give you sticker shock if you’ve never been. With adult tickets at $29.95 and kids at $24.95 the first thought is “for lights?!?! !” The other activities round out the full experience and make it worth it and, as you saw in Tip #3, weeknight tickets cost $5 less. 5. Consider making a trip out of it. The College Station/Bryan area has a ton to offer families. If you’re coming from out of town like many folks do plan to stay a few days if possible. There are museums, libraries and of course Texas A&M to see in the area. In addition, many hotels offer partner packages with Santa’s Wonderland. Utilizing their special rates you can get dropped off and picked up at Santa’s Wonderland and not have to park yourself. This season those offering special packages are Hawthorn Suites by Wyndham, Hyatt Place College Station, Best Western Premiere Bryan/College Station, Best Western Plus College Station Inn and Suites, and St. Nick’s Green Tiny Cabin Village and R.V. Campground (R.V.’s only until Spring 2019). Personally, my pick from the above would be the Hawthorn Suites. Mama loves a suite when traveling with family and the rate for a Santa’s Wonderland room is only $10 above the Best Available rate for most nights (and includes a $15 gift). The Hyatt Place rates ran $15-$30 over the Best Available rate on the nights I checked. For the Best Western options, their shuttle runs hourly, but the start times are too close to the opening time (on weekends the first shuttle runs an hour after Santa’s Wonderland opens). If seeing Santa is important to you, I’d recommend another hotel. 6. Plan to Christmas shop (bring your wallet) and save time for other activities like movies and music. There were some really cute shops with a lot of merchandise that I haven’t seen anywhere else in the area. Next time, I’ll plan in time to shop and check some people off my Christmas list. While most attractions at Santa’s Wonderland are included, there are some that cost extra like the petting zoo, pony rides, and picture packages. And, of course, there is food to be had. We found the food to be fairly reasonable (unless you’re having pizza which was $6 a small slice). My husband had a large burger that we felt was fairly priced. Special diets may want to plan ahead as lines can be long to wait in just to ask about allergy info. I’d recommend emailing ahead of time to identify what you can eat. Plan time to sit down. There are movies playing and the live music was one of our favorite parts. The girls loved the music! They danced nonstop through the whole set. There’s a winery for that. 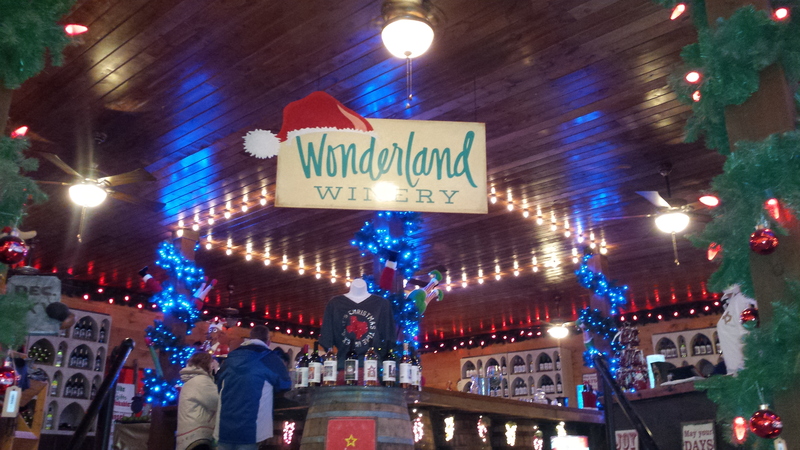 Wonderland Winery is on site offering local wines to drink and to buy for home. That takes care of half of my Christmas list! UPDATE: There is a satellite wine location now near the dining area! 8. Dress warmly for the NEW Frostbite’s Mountain snow tubing and to play on the Snow Playground! While Texas is still fairly warm this time of year, it gets colder at night and we do have cold snaps. We happened to visit during a rare cold snap and were in coats and gloves. Many families bring a fleece blanket for the hayride. New in 2018, there is one more reason to bring warm clothes. 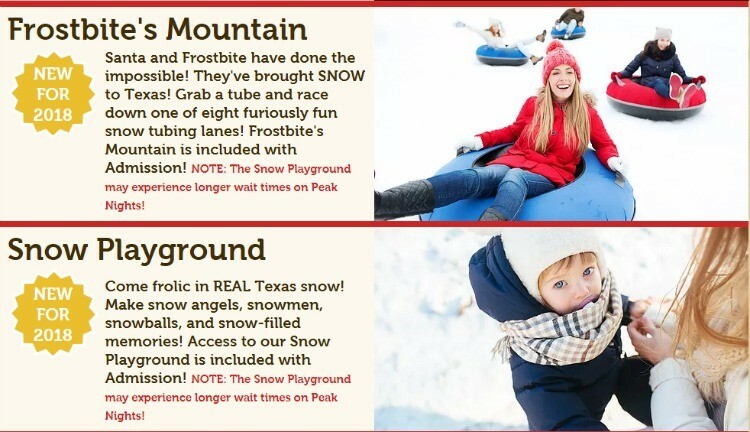 Frostbite’s Mountain, an eight-lane snow tubing experience, and the Snow Playground will open this season allowing Texas kids the rare chance to play in the snow. Yet another reason to be sure to get there early as these attractions are bound to have lines. Frostbite’s Mountain and the Snow Playground are included in the price of admission. Be sure to bring your camera to capture those snow pictures. We can’t wait to check it out on our visit this year. Whether it’s a stroller or you baby wear, bring a way to keep the kiddos close while waiting in line for the hayride. There were also some smart families with folding wagons that the kids sat in. The strollers can be a little tricky in the gravel of the hayride line but they’ll work everywhere else. 10. 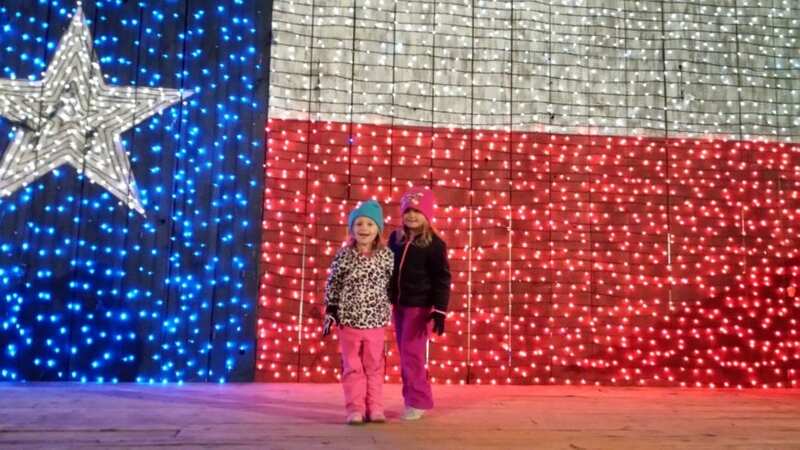 Get your picture taken in front of the giant Texas flag of lights. UPDATE: This area has been redone. There is a professional photographer there taking pictures at a cost. At first, I was upset because I thought it was charge only, but you can wait in the short line to get up in front of the lights and have a friend take the picture. This actually works better because the queue last year was informal and some folks took a LONG time. Now it’s regulated and orderly. Plus they restrung the lights and it looks spectacular. Above all else enjoy the lights displays. They are unique and varied works of art! Can’t make it this year? Watch our Facebook Live of the hayride! The first year we went with just our young daughters. On our second visit, we brought our then 12-year-old. I was skeptical as to whether he would enjoy himself or not. He was a huge fan of the hayride, the bull ride (FYI a parent has to sign a release so don’t go far while they’re in line), and his favorite discovery? SO MANY POKEMON. He was in his glory wandering around catching them all. Apparently, the concentration of people ups the amount you see and his only regret was that he didn’t stockpile more poke balls ahead of time. Overall, Santa’s Wonderland was a great visit and something we’ll be repeating annually as a family. As not the most Christmas-y person around (my husband says the Grinch is more festive), I was on board the second I saw snow flying in Texas. Plan extra time to just hang out with your family and listen to the fabulous bands and make Santa’s Wonderland your family tradition. Santa’s Wonderland is just one place to see great holiday lights. Here are more in Texas and the southwest, the Midwest, the Northeast and the Southeast United States. Have you been to Santa’s Wonderland? Share your tips in the comment section below. is married to Traveling Dad Greg Stump. Together they live in a multigenerational household with Greg's dad and 4 children- a 14 year old boy, a 7 year old girl, a 5 year old girl, and a 1 year old boy. Nasreen also birthed two twins as a gestational surrogate for her BFF. For years Nasreen spent up to 5 nights a week on the road as a territory sales manager covering over 21 states during her tenure. She left in 2016 to help out more at home with her father in law's cancer treatment schedule. Nasreen specializes in business travel, pregnant travel, medical travel and travel with children of varying ages. Lady loves to road trip. Last summer she hit the road from Texas to Vermont and back solo with 4 kids while pregnant with twins. Addicted to social media she shares her adventure on the road with those back home. She is back in Texas after 10 years in the Northeast. This is an absolutely wonderful guide! I hope you don’t mind but I linked your article to our Facebook post. We rent RVs and constantly look for destination ideas and advice for our renters. Your RV campground suggestion is incredibly useful. You can find us at SunCruisinRV.com where you can also find a link to our Facebook age. Are there bus tours to Santa Wonderland? I love Texas. Thank you for sharing this great post.